Considering bathtub paint for a dingy or chipped tub? DIY painting kits are widely available at home improvement stores in most states around the county. In fact, bathtub paint has become a popular option for people who would like to refinish, rather than replace, an ugly tub. While DIY bathtub painting kits may seem like a simple and easy solution, they’re not the best option if you’re aiming for an outcome that will last. We know from experience that these kits don’t always result in the smooth finish the consumer wants. Aside from that, if not applied correctly, the finish may peel or yellow. Many of the tubs we resurface are ones in which the resurfacing paint didn’t quite work out. The fumes from the epoxy paint products used in these kits can also be dangerous and irritating. In fact, stripping and resurfacing tubs can be dangerous even for professionals, so having the appropriate equipment is extremely important. These kits also require a lot of time and energy from the DIYer, who will have to cut away old caulk, clean and sand the bathtub and then apply the paint with a roller or brush, which might result in visible paint strokes and bubbles. Do you really want to shell out more cash to have a professional come and fix it? You’ll save money, times and avoid frustration by letting us come and do it right the first time. Call your Miracle Method professional for a smooth, glossy finish! Miracle Method’s resurfacing process can extend the life of your bathtub up to 15 years, and of course, will save you thousands of dollars in replacement costs. 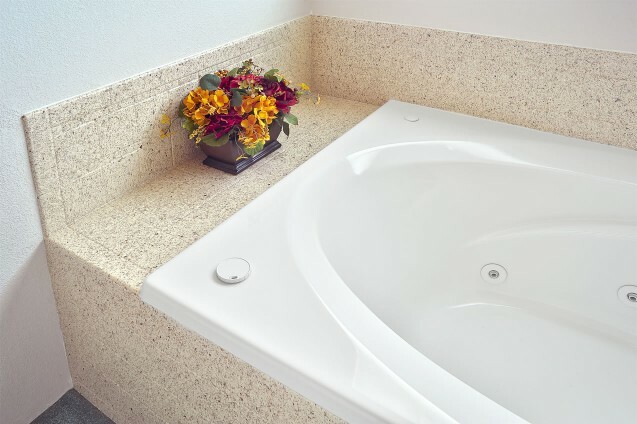 Our professionals will sand down the tub, repair chips or cracks and then restore the surface using advanced acrylic coatings and a proprietary bonding agent. You don’t have to be stuck with an ugly bathroom. Call us today at 1-888-271-7690 to learn more about our services and refinishing process.